Realistic animal dummies, such as a rubber mock-up of a mare’s reproductive system, are valuable in training vet students, who can get “hands-on” experience before dealing with live animal cases, according to researchers. Teaching animals are increasingly being replaced by dummies for training in veterinary medicine, providing students with an opportunity for repeated and stress-free training sessions. Researchers at the University of Veterinary Medicine in Vienna have shown that simulator-based training can be extremely efficient to achieve learning outcomes in veterinary gynaecology. They found that, after simulator-based training, students were less stressed when confronted with their first live animal cases. The results of the research were published recently in the scientific journals Theriogenology and Reproduction in Domestic Animals. Simulator-based training of students has been used at the veterinary school since 2012. Its Skills Lab is a simulated veterinary practice in which students have the chance to train using variety of veterinary interventions on animal dummies. Christina Nagel, Christine Aurich and their team from the university’s Centre for Artificial Insemination and Embryo Transfer set out to discover if the simulator-based training was as efficient as training on live animals. They analysed for the first time the efficiency of simulator-based training in large animal gynaecology. Twenty-five third-year veterinary students participated in the study involving gynaecological examination of mares. Students were randomly allocated to three groups and taught palpation and ultrasonography of the equine genital tract in different ways. Group 1 trained four times on the simulator, consisting of a plastic box shaped like the back-end of a horse with exchangeable rubber genital organs. Group 2 students were trained four times on teaching horses, whereas group 3 had only one training session on real horses. Two weeks after the last training session, the researchers tested the learning outcomes. All students were asked to examine a horse mare and to make a diagnosis. Students who had trained four times on horses scored best with regard to a correct diagnosis. Students who had been trained only once on horses had the worst results and those trained solely on the simulator scored in between the two other groups. There were no major differences between groups with regard to ultrasonography of the genital tract. “Simulator-based training prepares the students very efficiently for diagnostic procedures on live horses,” said Nagel, who was principal investigator of the study. “Simulators are, however, not only an additional teaching tool for our students but also a contribution to animal welfare. The stress perceived by horses during gynaecological examinations had already been studied in 2007 by Aurich and her team. She has now gone on to assess how students felt when examining a horse compared to examining the teaching simulator. Students with previous training on the simulator were less stressed when finally exposed to a real horse, she found. The conclusion was based on recordings of the students’ heart rate and salivary cortisol concentration during the training sessions and tests. The results of that work were published recently in the scientific journal, Reproduction in Domestic Animals. “The results from these studies encourage us to increase the use of teaching simulators for the training of future veterinarians,” Aurich said. 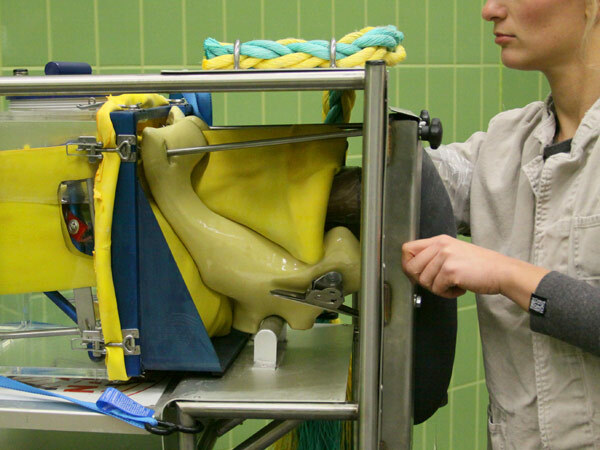 The studies on simulator-based training in equine gynaecology were supported by the KELDAT programme of veterinary teaching establishments in Austria, Germany and Switzerland. The article “Teaching of diagnostic skills in equine gynecology: Simulator-based training versus schooling on live horses” by Christina Nagel, Natascha Ille, Jörg Aurich and Christine Aurich was published in the journal Theriogenology. The article “Stress Response of Veterinary Students to Gynaecological Examination of Horse Mares – Effects of Simulator-Based and Animal-Based Training” by Christina Nagel, Natascha Ille, Regina Erber, Christine Aurich and Jörg Aurich was published in the journal Reproduction in Domestic Animals.